Lucketts Group has helped a team of adrenaline-seeking fundraisers raise nearly £2,000 for a local charity. 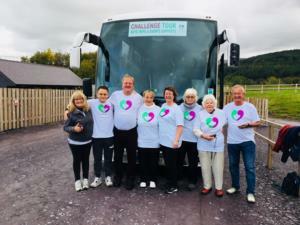 The coach firm laid on a vehicle and driver to help a team of nine people travel to Wales to undertake a charity challenge with a difference on October 6. Brave fundraisers from around the Portsmouth area took on one of the longest zip wires in Europe to raise money for The Elizabeth Foundation. The charity, based in Portsmouth, supports infants and pre-school children with hearing loss. Its team helps babies and children with all degrees of hearing loss to learn to listen and speak. To raise money for the charity a team of nine people – aged from 35 to 83 – braved the 1555m zip wire at Zip World in Snowdonia. They travelled at speeds of up to 125mph as they whizzed 500m above Penrhyn Quarry.